All the 23 players invited by the Super Eagles coach, Gernot Rohr, for the Africa Cup of Nations qualifying match against Seychelles and the friendly match against the Pharaohs of Egypt are now in camp for the national assignment. While it was only seven players that were on the ground on Monday when the camp officially opened in Asaba, officials confirmed that all the players are now in and set for action. According to a tweet on the official handle of the Super Eagles, the last set of arrivals were John Ogu, Etebo Ogenekaro, Francis Uzoho, Victor Osimhen and Henry Onyekuru. The early birds on Monday were Alex Iwobi, Odion Ighalo, Semi Ajayi, Valentine Ozornwafor, Daniel Akpeyi, Ikechukwu Ezenwa and Ikouwen Udoh. The number then increased on Tuesday with the likes of vice-captain Ahmed Musa, Leon Balogun, Kenneth Omeruo, William Troost-Ekong amongst others joining their colleagues in camp before the confirmed arrival of the last set. 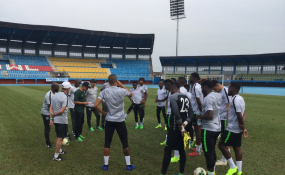 The Super Eagles had their first training session on Tuesday at the Stephen Keshi Stadium. Also, the delegation of the senior national team of Seychelles, known as Pirates, has landed in Nigeria for Friday's match against the Super Eagles. Nigeria have already secured their place in the finals and will be in the pot for the draw on Friday, April 12 at CAF's headquarters in Cairo, while the Pirates were long eliminated and have only come to fulfil the fixture. A 29-member delegation of the Pirates arrived Abuja aboard an Ethiopian Airline flight on Tuesday afternoon, and would be flown to Asaba on Wednesday. The Eagles are also preparing for a prestige friendly game against the Pharaohs of Egypt, who are seven-time champions and record winners of the continent's most prestigious football diadem.